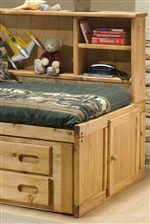 This pine desk with a vertical slat back and upholstered seat adds great seating to use with the coordinating desk and hutch or with the loft bed. The casual rustic styling offers a great look for any youth bedroom. The Bunkhouse Upholstered Desk Chair by Trendwood at Sparks HomeStore & Home Furnishings Direct in the Thatcher, Cottonwood, Safford, Sedona, Morenci, Arizona area. Product availability may vary. Contact us for the most current availability on this product. 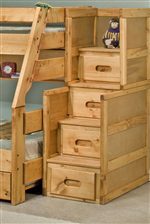 The Bunkhouse collection is a great option if you are looking for Casual furniture in the Thatcher, Cottonwood, Safford, Sedona, Morenci, Arizona area. 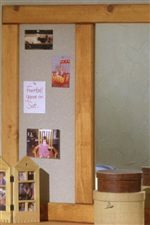 Browse other items in the Bunkhouse collection from Sparks HomeStore & Home Furnishings Direct in the Thatcher, Cottonwood, Safford, Sedona, Morenci, Arizona area.